Modular synthesizer with memory, swappable analog filter, sampler and granular effects. 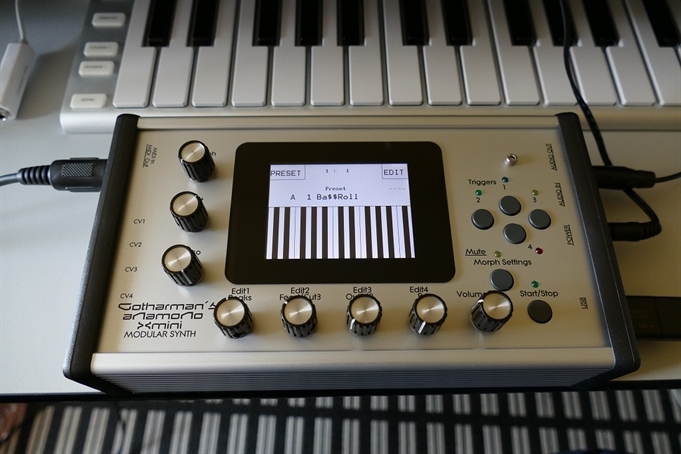 Anamono Xmini has a number of built-in "modules", like oscillators, samplers, analog filter, LFO's and so on. Every module has a number of modulation input connectors, and most modules also has a number of audio input connectors. For the modulation input connectors any modulation output from any other module can be connected. For the audio input connectors, any audio output from any other module can be connected. The analog filter also appears as a module. 1024 preset slots and 1024 song slots are available, all user programmable. -22 minutes of sampling time/ 256 samplings. 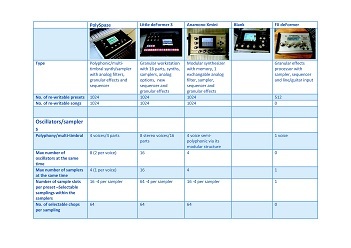 Each sampling can hold up to 64 "sub" samplings, when the "Import Samplings As Chops" function is used, so the total maximum number of samplings is 16.384 (256x64). -Fully modular in a compact design! -Roland JD-XA MIDI filtering system. JD-XA sends multiple note on's and off's, every time you play a note. Xmini detects this, and filter out the unnescessary ones, so you can use your JD-XA as a masterkeyboard. Works with both the internal sound module and the sequencer.